While editing the Winter 2016 issue of Mayflower Descendant, I searched the draft articles for additional genealogical facts for the families presented. 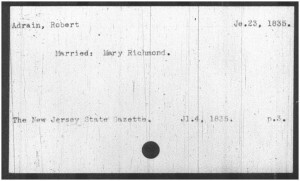 Christopher Carter Lee’s article – “Elizabeth (Briggs) Shippey and her husband Ishmael of Raritan Landing, New Jersey, and their descendants through Specimens of Josiah Shippey” – traces several generations of John Alden descendants in New Jersey and New York. 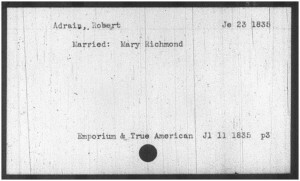 As surviving vital records for those two states are often scattered in various places, this article is a great example of gathering records from genealogy and newspaper websites, national genealogical repositories, and local libraries and genealogical societies. Then, as I was conducting a microfilm search for film #542512 in the Family History Library catalog, I learned this specific record came from the collection “Vital statistics from Trenton newspapers, 1800-1900,” which was an alphabetical listing of newspaper abstracts. (Previous online newspaper searches for this marriage had turned up nothing.) My colleague at the Family History Library scanned the two nearly identical copies of this abstract, which were taken from The New Jersey State Gazette and the Emporium & True American. Obviously this announcement had much more information than the initial database on FamilySearch, including the place of marriage, the bride’s father’s name, and that he was deceased and had been a captain in the U.S. Army. The path to find this record involved an online search, then a microfilm scan, and then a second online search, and it was obviously worthwhile for the more detailed information shown above. Thank you, Chris, for detailing the steps you took to dig deeper. I know I’m going to be using this method. And an excellent example of the limitations of relying on indexes alone for information. Useful when the original source is no longer available, but the perseverance (and creative thinking) certainly paid off. And would more so in the case of indexing errors! Thanks for the step by step through the various records to get to the original. I am anxiously awaiting several vital records from the New Jersey State Archives as we speak–part of the documentation for the Mayflower application we talked about on the Salt Lake trip in 2014 (John Howland through David and Silence Hamlin). I am finally pulling all the information together. I have noticed that there are no New Jersey newspapers on the Chronicling America site, and no Bergen County newspapers at Newspapers.com. 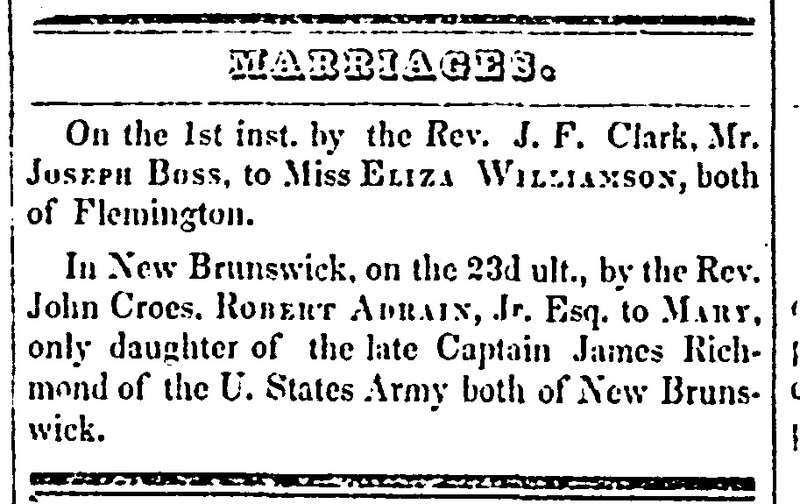 My ancestors are sometimes mentioned in the New York City papers, and sometimes in a Paterson, N. J. paper at FultonHistory, but I am going to see if there is better New Jersey coverage at GenealogyBank. How would I tell if New Brunswick is New Jersey or Canada? If you came upon this record out of the context of this family, a Google search on Emporium & True American would show that it was a newspaper out of Trenton, New Jersey, published in the early 1800s. Hope that helps. According to Wikipedia, John Croes (1762, Elizabeth, New Jersey – July 26, 1832, New Brunswick, New Jersey) was a Bishop in the Episcopal Church. Another possible record to search!